1. Preheat the oven to 230°C, gas mark 8. 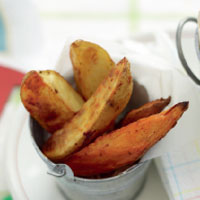 Toss the potato wedges in the olive oil, lime juice and spices, if using. 2. Scatter the wedges on a baking tray and roast for 30 minutes, turning once, until golden brown. Season and serve. This recipe was first published in Sun Jul 10 15:26:00 BST 2011.